The author, Professor Emeritus in Geography at Tel Aviv University, has written a very detailed and insightful study of Israel’s borders with what is today the Palestinian Authority. If there is any overall criticism it is that the writer sometimes gets bogged down in geographic nitty-gritty that supports her conclusions but is meaningful only to those few with a very detailed knowledge of the areas concerned. Israel’s post-independence borders were, for the most part, not drawn as a result of bilateral negotiation or ethno-economic considerations. They were essentially ceasefire lines with minor modifications agreed upon more for tactical military considerations than for population concern. Several villages were split, and farmers were separated from their land. Communities were left to develop separately in Israel and in Jordan (rulers of the “West Bank”). The establishment of the Green Line, the border between Israel and Jordan, had significant demographic implications. In Western Samaria, for example, Arabs caught in Israel after the 1948-1949 fighting were cut off from their administrative and economic centers in Jenin, Nablus and Tulkarm. Even when they could farm their land, new markets had to be found for produce. Over the years there was a re-focus toward the Israeli cities of Natanya and Hadera. Simultaneously, the Jordanian side of the border expanded with the influx of refugees; after the 1967 war there was further population growth, as other Arab West Bank residents moved to towns close to the former Green Line to find better paying employment in the Israeli economy. The separation wall now being erected to provide security has deep implications. 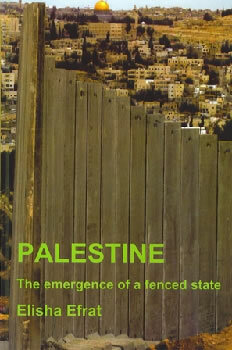 The author perceives the current wall to be the Israeli statement of a lasting border. She goes to great length in considering an ideal route for the new border that will permanently divide Israel from the emerging Palestinian entity. The discussion, however, is akin to negotiating with one’s self. She is proposing a solution that is no less “Israeli,” than the current fence. What is blatantly clear from Elisha Efrat’s arguments is that reverting to lines of 1949 / 1967 would be closing one’s eyes to demographic and economic developments which have changed the area. It would be as futile as to try to turn the historical clock back to 4 June 1967! Jerusalem is special for both religio-historic and topographic reasons. It is one of the very few capitals built on mountains higher than 800 meters. On the one hand Israel has tried to transform the city from a quiet town into the country’s largest city, but on the other hand topography imposes practical physical limits on expansion. This is only further complicated by conservation efforts to leave some areas undeveloped. Imposing a separation fence on the population jig-saw only adds a new complication. The current municipal boundaries of Jerusalem were drawn in 1967 and revised in 1993. As the author explains, the city boundaries “lack any urban logic. They were drawn hastily and artificially for the purpose of defining a perimeter ring around a large area, where Jewish neighborhoods could be built in the future…” In many ways the separation fence only freezes this illogical situation, made even more complex by the intricacies of political indecision and contradictory polices. From the analysis in this book it is clear that from one perspective Israel wants a “united and undivided Jerusalem.” Yet, the wall keeps large Arab neighborhoods inside Jerusalem, which Israel is simultaneously declaring a Jewish city. The fence also poses the economic problem of distancing excluded Arabs from the nearest hub of employment and commerce. This book certainly provokes thought. It should be read to widen perspectives and consider legitimate issues raised, rather than using it as a practical guide to solutions on the ground. It is only proper to mention that proofreading and the translation from the original Hebrew could both be much more professional.